More than 10 years ago my friend Elizabeth bought me a pass for yoga classes with a great yoga teacher Barbara Eastman. I half heartedly showed up with little or no expectations, just another exercise class I thought. It was more. That very first class, I was inspired and connected in to yoga and its potential to transform lives. I continued to take classes with Barbara and went on to study with Mirka and Gary Kraftsow founders of the American Viniyoga Institute. So for the last 10 years the practice and traditions of yoga have informed my life. It has become a path way through which I get ever increasing glimpses of my true self. My practice has included the exploration of Asana, the physical, Pranayama, breath and vitality, the mind, the personality and the heart. When I began constructing the Twisted Purl I was in a serious car accident. I had broken bones, bruised body and a brain injury. When I became conscious a day or so following the accident the practice of mindful yoga was important to my healing process. 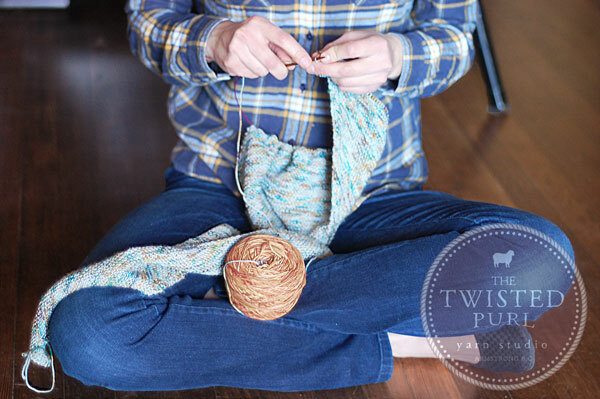 The Twisted Purl has been a big part of how I healed and became whole again. Because I had committed to creating the store knitting was what I did to recreate new pathways in my brain. Knitting became my practice when much of the other Yoga practices that I did were not available to me. As I found new strength and physical abilities I have slowly returned to asana.